Information is power - any knowledge worker will tell you that. And understanding how these workers do their jobs provides valuable insight for strategizing processes, technology and management. Technology is key to the daily life of information workers to help them communicate, create and review documents and collaborate with teammates. 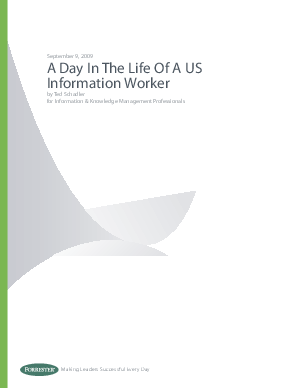 This new Forrester white paper provides a snapshot of a typical day in the life of a U.S. information worker. It reveals how workers are employing new technologies and applications, interacting with their teams and engaging in mobile activities.